Protecting water quality is a core part of CUSP’s mission and the definitive indicator of the health of the watershed. Through our monitoring program, we strive to understand water quality conditions and proactively address pollution throughout the watershed. Monitoring data guide project prioritization and provide the scientific basis for continually improving the approaches and techniques we use to address watershed issues. Support monitoring efforts by learning more below and donating today. 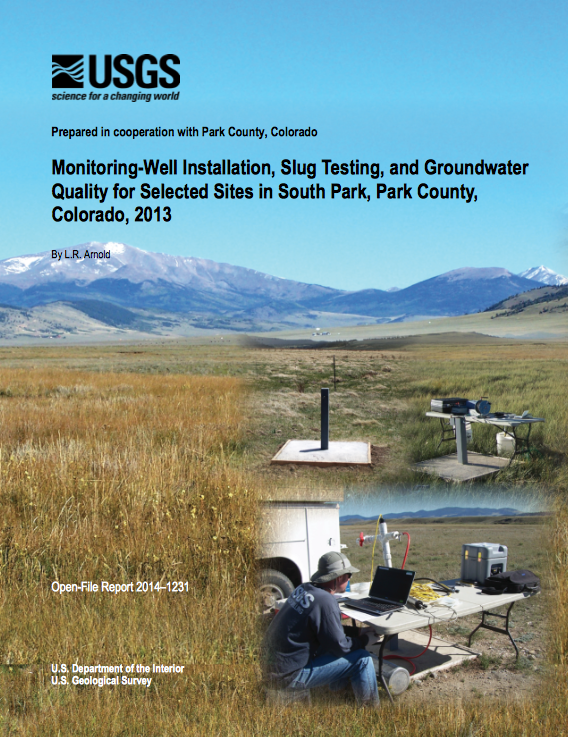 During May–June, 2013, the U.S. Geological Survey, in cooperation with Park County, Colorado, drilled and installed four groundwater monitoring wells in areas identified as needing new wells to provide adequate spatial coverage for monitoring water quality in the South Park basin. Documentation of lithologic logs, well construction, well development, slug testing, and groundwater sampling are presented in this report. 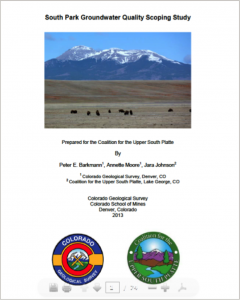 CUSP requested the Colorado Geological Survey and the U.S. Geological Survey to prepare a scoping study to address baseline water quality monitoring in South Park in anticipation of future energy development in the area. The purpose of this scoping study is to determine the number and optimal locations for the installation of shallow monitoring wells across the greater South Park area. The study summarizes the stratigraphic and tectonic setting with respect to potential fresh water aquifers and describes potential vulnerability of groundwater resources to possible energy resource extractions, and proposes a network of monitoring wells. As energy development booms in Colorado, energy developers have looked toward South Park to expand their operations. This interest has led to a concern over potential impacts on vital water resources in the area. In response to community concern, CUSP initiated the South Park Baseline Water Quality Study to document current surface and groundwater quality in South Park. This data will provide the community, regulatory agencies, and developers with baseline water quality conditions, so everyone can assess any changes in water quality. 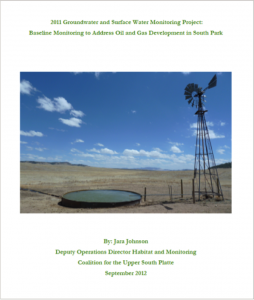 This report is an addendum to the 2011 Groundwater and Surface Water Monitoring Project: Baseline Monitoring to Address Oil and Gas Development in South Park report written by Coalition for the Upper South Platte (CUSP). 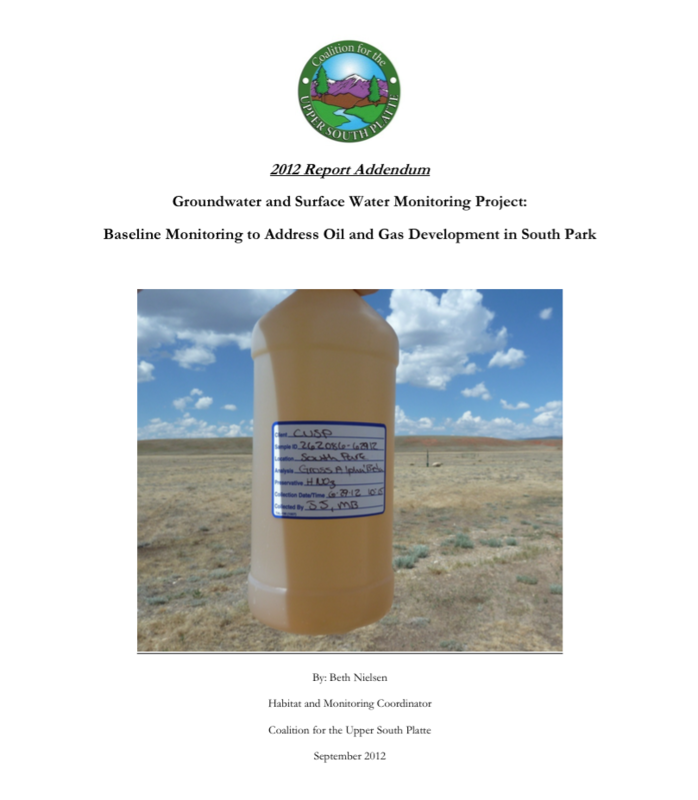 The 2011 report discussed the entirety of the groundwater and surface water monitoring project in South Park and the results of CUSP’s first round of sampling. This addendum will discuss the results of the 2012 round of sampling conducted by CUSP on surface and groundwater sources of note as well as any new information regarding the project and 2013 sampling activities.